One of the primary reasons for me to get a road bike is to compare it with my drop bar Dahon Boardwalk. This Dahon Boardwalk has been modified thoroughly, and it is now more of a road bike than a mere folding bike. It is interesting to ride these two bikes and compare them, to see if the common assumptions between road bikes and folding bikes are true or not. Nowadays, I try to alternate my rides between the Dahon Boardwalk and the Merida Scultura 5000. By doing so, I can detect and appreciate the differences and similarities between these two types of bikes. As this testing is still on going, I am unable to write a comparison of the ride quality yet. However, what I can do now is to compare the frame geometry of the Dahon Boardwalk with the Merida Scultura 5000. 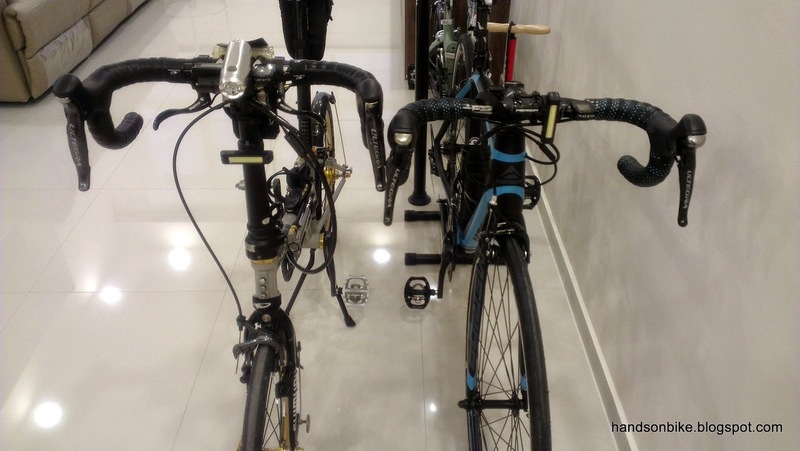 By placing the bikes side by side and taking some measurements, the similarities and differences can be seen clearly. 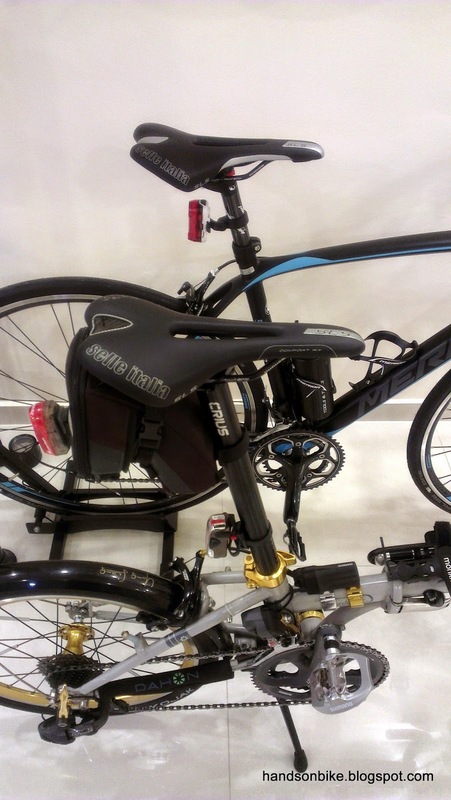 What are the geometry differences between the Dahon Boardwalk and the Merida road bike? How do they affect the riding posture and feeling? Read on to find out! In order to have a fair comparison on the frame geometry, we will first need to set a datum to compare the bikes. In this case I chose the centre of the BB or crankset to be the datum. This will allow me to compare the other dimensions such as the saddle height, handlebar reach and such. Using the centre of the crankset as the datum. I placed the bikes such that the centre of the cranks are aligned with each other. 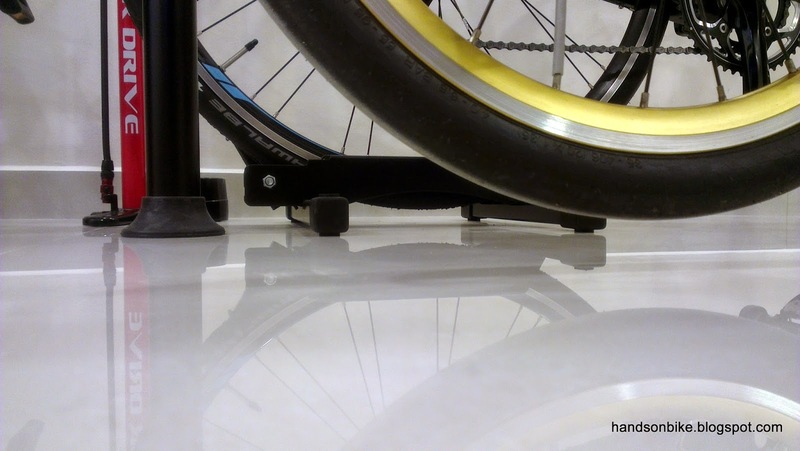 When the kickstand and bike stand are used to set the bikes upright, the rear wheel is unable to touch the floor. In this case, both rear wheels are set at the same distance off the floor for best accuracy. Comparing the seat tube angle. The Dahon seat tube is slightly steeper as the seat tube ends behind the BB, and not on top of the BB. Does not affect the final saddle position though. 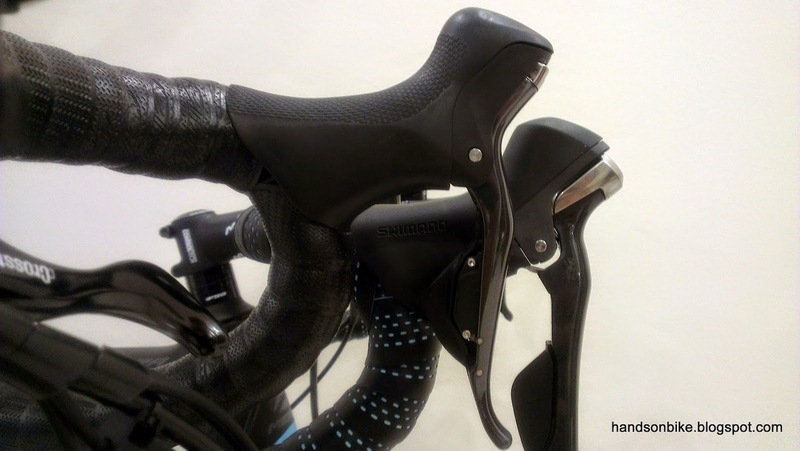 Saddle height is practically the same! Both saddle's fore-aft positions are also about the same. 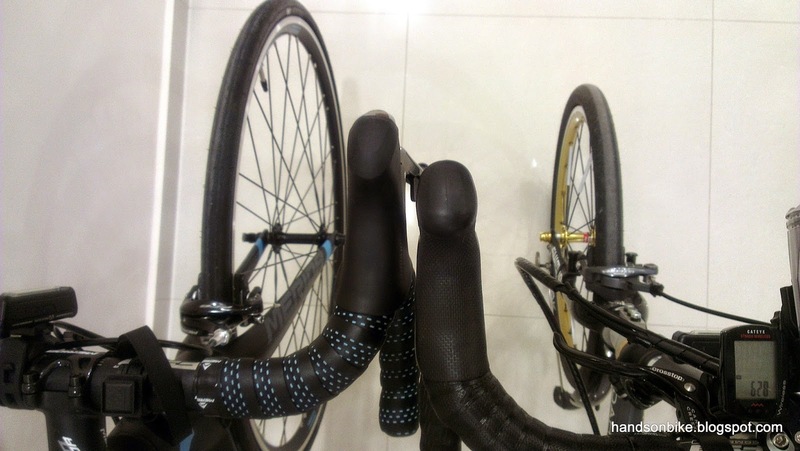 This also means that the saddle position relative to the crankset is the same across these two different bikes. Comparing the rear axle positions to determine the chain stay length. They differ by a bit. 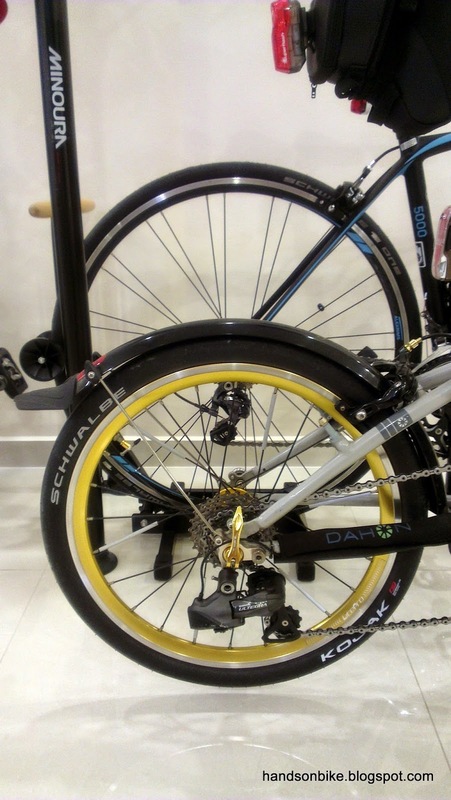 The Dahon chainstay length is 400mm, while the Merida chainstay length is about 410mm. A shorter chainstay length will give a more nimble ride. 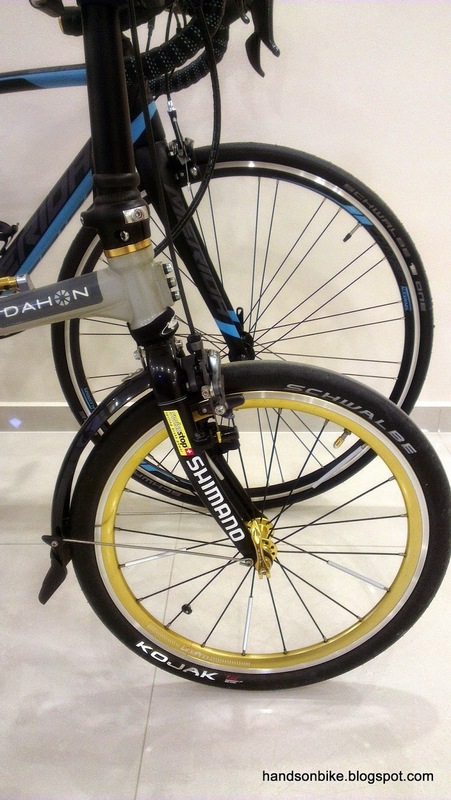 Different gap between the rear wheel and the seat tube, due to the different wheel sizes. Does not affect the ride quality. Comparing the front axle positions. 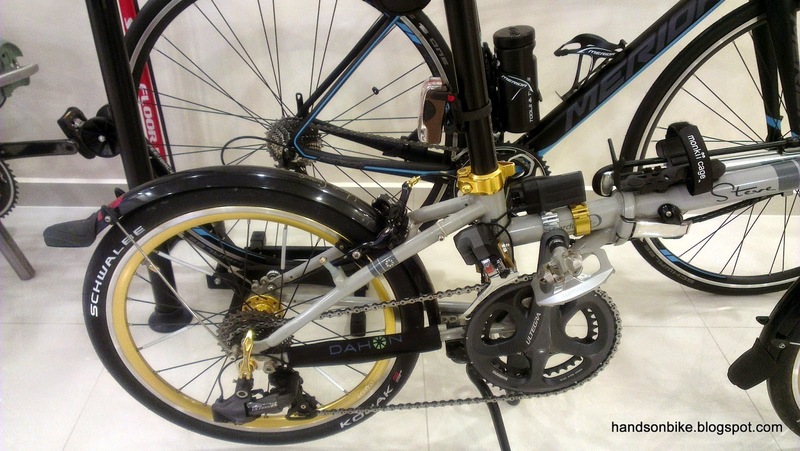 The Dahon front axle is about 20mm further forward of the Merida. This can affect steering feel, but this is not the only factor. 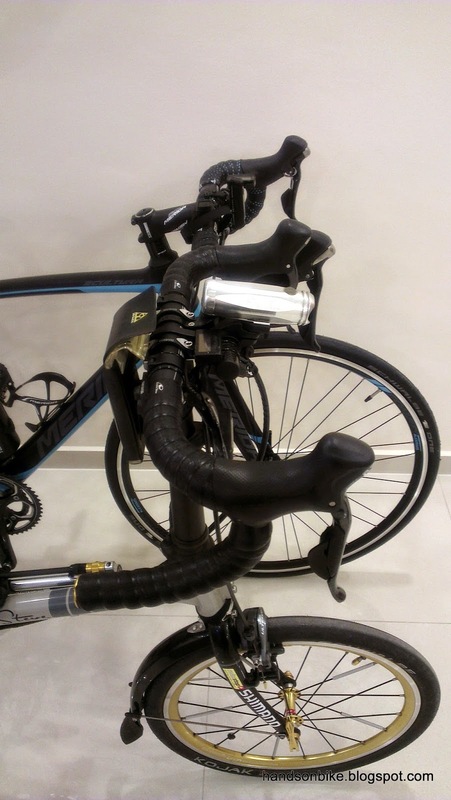 The head tube angle and handlebar position also affects the steering feel of the bike. So far, the frame geometry is quite similar between the Dahon Boardwalk and the Merida road bike. 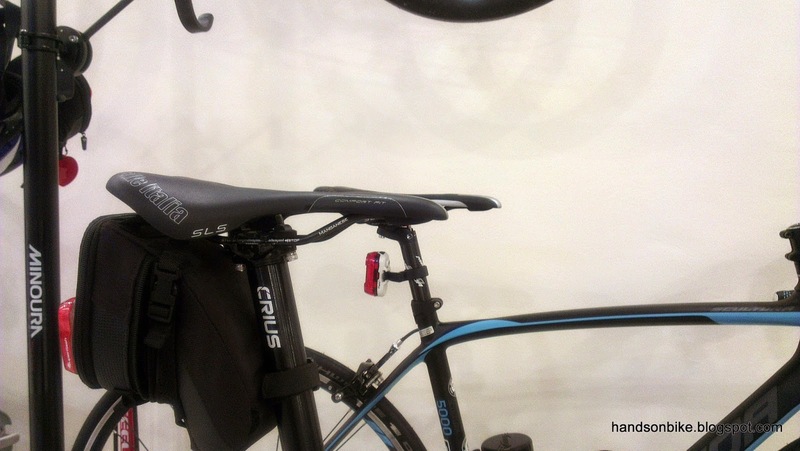 With a similar saddle height, the pedaling feel will be the same across the two bikes. The difference in chainstay length cannot be felt due to the small difference of less than 10mm. For comparison, trekking bikes have longer chainstay lengths of around 440mm for better stability and rear wheel clearance (for fenders and front derailleur). A short chainstay length gives a agile and nimble feel to the bike, and steering feels sharper due to the short rear end. However, it can be less stable at high speeds as the rear end tends to move around more compared to a bike with a longer chainstay. Next, let us move on to the position of the handlebars and the road shifters. There is a much more obvious difference in positions for this area, due to some frame and handlepost limitations and certain preferences. 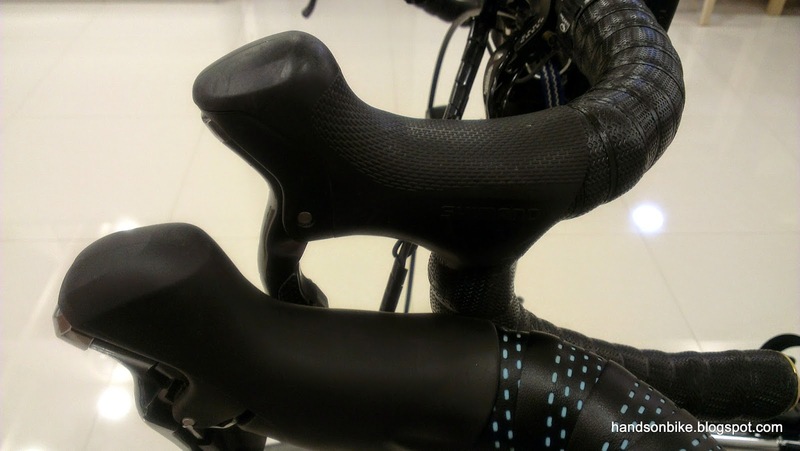 Both handlebars are FSA compact drop bars of 400mm width, and thus the drop bar dimensions should be the same. Overview of the handlebar positions. Generally, the Dahon handlebar is higher up and further back compared to the Merida handlebar. 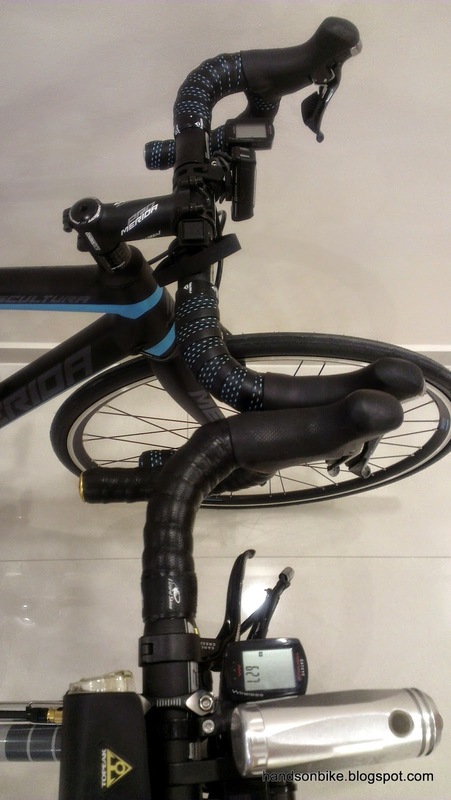 Top view of the handlebars. The Dahon handlebar is about 30mm further back compared to the Merida handlebar. Front view. The Dahon handlebar can be seen to be higher than the Merida handlebar. Comparing the shifter positions. 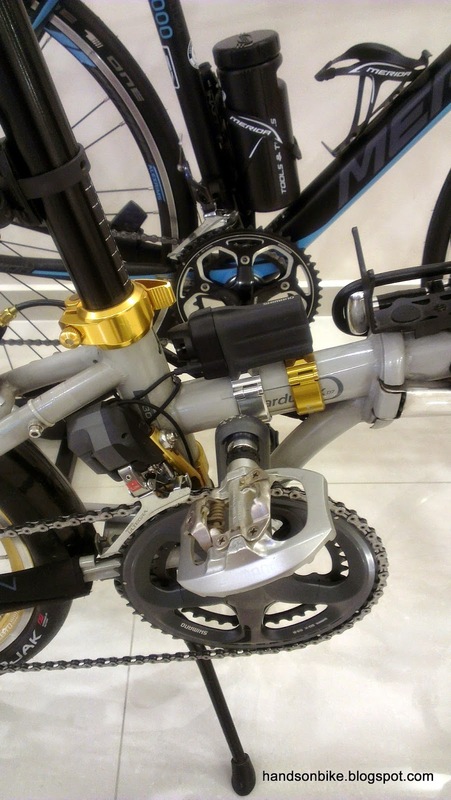 Since the shifter positions are related to the handlebar positions, the shifter on the Dahon can be seen to be further back. Close up view showing the different shifter positions. As can be seen, the shifter on the Dahon is both higher and further back comparatively. Another view of the shifters from another angle. Note the different hood shapes. Ultegra 10 speed 6770 Di2 shifter on the Dahon Boardwalk, and the new Ultegra 11 speed 6800 mechanical shifter on the Merida Scultura 5000. By a rough estimation, the shifter hood position on the Dahon Boardwalk is about 30mm higher and 30mm further back. 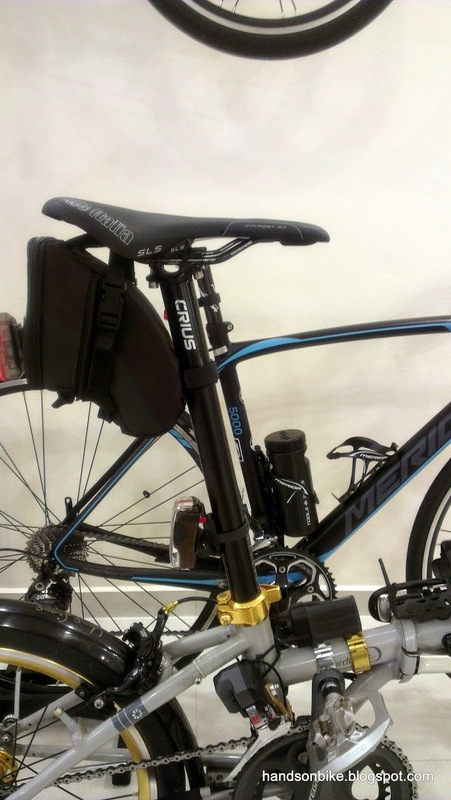 This gives the Dahon a shorter reach and a less bent-over position compared to the Merida road bike. It is exactly what I wanted, as the Merida road bike is supposed to put the rider is a more aerodynamic position for fast riding. The difference of 30mm in the height and reach makes a big difference to the steering feeling. With the Dahon Boardwalk, there is a more relaxed feel when holding the shifters, due to the shorter reach and more upright position. As for the Merida road bike, the lower position and slightly longer reach creates the perfect geometry for a road bike, and makes me want to ride faster. If I wanted to fully replicate the feel of a road bike on the Dahon Boardwalk, I can rotate the stem forward to give a similar handlebar position as the Merida road bike. However, I much prefer to keep the current handlebar position of the Dahon Boardwalk, as it is more comfortable and great for more relaxed riding. In summary, the major frame geometry differences between my Dahon Boardwalk and the Merida Scultura 5000 are at the handlebars. The different shifter positions give a different feel to the ride. Even so, the positions are not that much different and can be adjusted to be the same if desired. 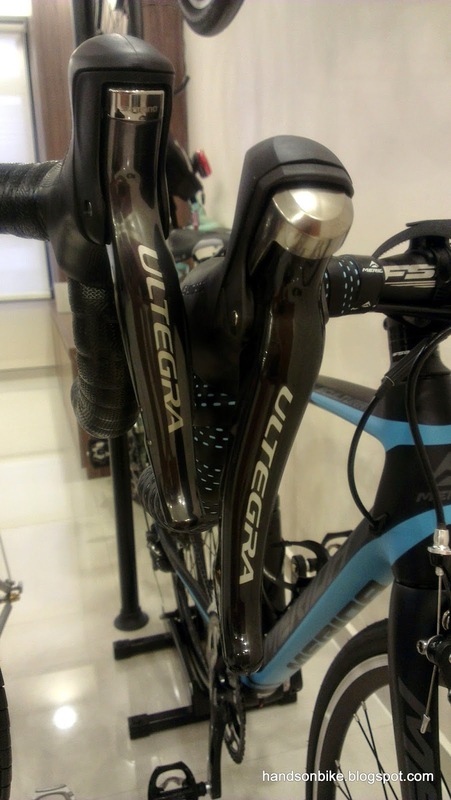 Finally, a picture showing the two different Ultegra shifters! Ultegra 10 speed 6770 Di2 shifter on the Dahon Boardwalk, and the new Ultegra 11 speed 6800 mechanical shifter on the Merida Scultura 5000. My favourite picture of this blog post.